VANCOUVER, July 13, 2016 /CNW/ - While just over half of current Canadian retirees (53%) say a government pension is helping fund their retirement, only 35% of working-age Canadians say that's likely to be the case for them. Instead, an increasing number of pre-retirees in Canada say they expect personal pension schemes, cash savings, as well as property will fund their retirement. This, according to HSBC's the Future of Retirement: Generations and Journeys, a new global retirement report capturing the views of 18,207 people across 17 countries and territories worldwide – including 1,037 in Canada. The complete Canada and global reports are available at www.hsbc.ca/retirement. Betty Miao, Executive Vice President and Head of Retail Banking and Wealth Management, HSBC Bank Canada said: "While Canadian retirees rank as some of the happiest in the world, almost half of working-age people in Canada are not currently saving for retirement. Furthermore, they are twice as likely to consider selling their homes to fund their retirement compared to those who have been able to stay on-course with their retirement savings plans." Pre-retirees expect to find retirement savings "underneath the floorboards": One in five (20%) of Canadian pre-retirees – compared to just one in 20 (5%) of current retirees –say that income from downsizing or selling a primary or secondary property will help them fund their retirement. Canada ranks well above the global average (12%), trailing just behind Australia (26%), the UK (22%), and Singapore (21%). Furthermore, those closer to retirement are more likely to think that income from downsizing or selling property will help them fund their retirement. About half of working-age Canadians are not currently saving for retirement. Almost half of pre-retirees in Canada (48%) say they have yet to start or are currently not saving for retirement. Working-age respondents in Argentina (65%), Taiwan (54%), France (53%), and Mexico (52%) are the most likely to say they're not currently saving for retirement. 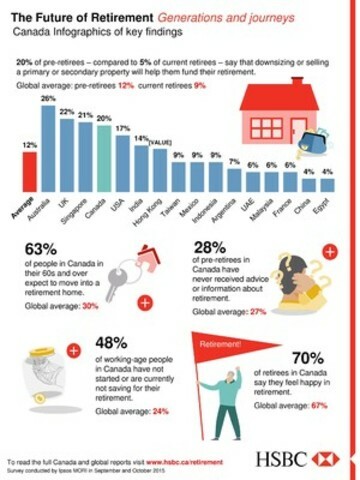 Canadian retirees some of the "happiest" in the world! Seven in 10 (72%) of Canadian retirees report feeling "happy" in retirement, second only to retirees in Mexico (80%). In comparison, retirees in Hong Kong (50%), Singapore (50%) and Taiwan (53%) are the least likely to describe their retirement as "happy". Further, almost 8 in 10 (77%) working age Canadians who have started saving think they will feel happy in retirement, compared to just over half (55%) who have not. Start saving now… yes, now. With the benefit of hindsight, two in five (39%) pre-retirees would have started saving for retirement at an earlier age, as would one in three (32%) retirees. The earlier you start, the harder your savings will work for you. 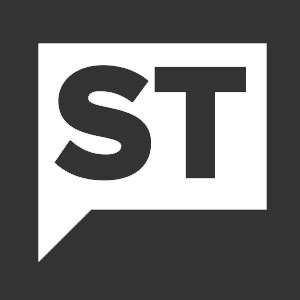 Do talk about it with your friends and family, but also get professional help. About half (45%) of those who have received retirement advice and/or information say it gave them a better understanding of the financial implications of their choices, and about three in 10 (32%) said it helped them avoid making mistakes – only 4% said there were no benefits. Take care of yourself – you're worth it. Priorities differ by age, and while having good health (71%) and enough money for a comfortable life (48%) rank highly for Canadians of all ages, these are much more likely to be important for older generations –in fact, 87% of Canadians over the age of 60 say it's their main priority. Added Miao: "While a change of lifestyle or move to retirement living may be a great thing come retirement, it's worth noting the wisdom shared by many of today's retirees: start saving earlier, take good care of yourself and your health, and don't hesitate to get advice from trusted professionals along the way – they're there to help." 28% of Canadians are Strategic Planners (27% global average). They are typically higher earners who plan early and strategically, and they are able to enjoy the luxuries in life as a result. 28% of Canadians are Comfortably Affluent (well above 21% global average). They tend to be older with financial plans in place, and are able to relax and enjoy time with family and friends. 24% of Canadians are Concerned Realists (well above 17% global average). They have a more pragmatic approach to life and are likely to be cautious in their planning and spending. 13% of Canadians are Committed Savers (well below 20% global average). They are inclined to value saving over spending, but are more likely to face struggles along the way. 7% of Canadians are Assured Optimists (below 16% global average): More optimistic about the future, they are comfortable taking risks while having fun and enjoying life.